At present, many kinds of fuels and chemical products are manufactured from petroleum in oil refineries. By contrast, a biorefinery manufactures these goods from biomass. 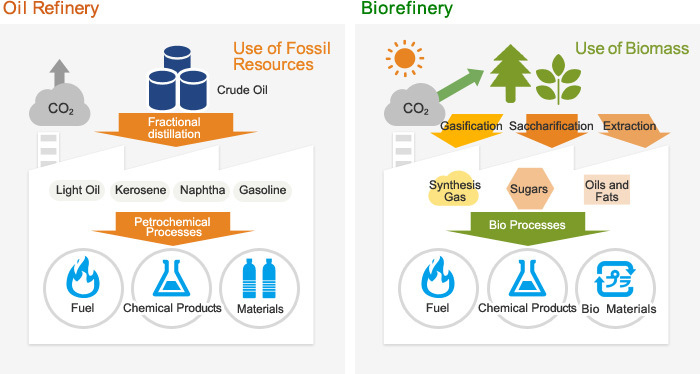 Nippon Paper encourages in the development of biorefinery technologies that convert wood material into various products. Dissolving pulp (DP) is obtained through isolation of pure cellulose from wood material, in turn becoming the raw material for the rayon textiles. At our Kushiro Mill, we adopted continuous DKP method as the first time in Japan for manufacturing DP. Carbonization at lower temperatures than those normally used to make charcoal allows the manufacture of biomass fuel with good grindability and water resistance, as well as energy density much higher than that of wood. 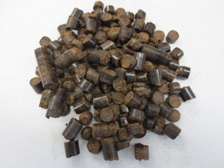 This biomass fuel is able to raise the co-combustion rate of biomass in pulverized coal boilers. Together with chemical manufacturers, we start research that separates wood material into its three major constituents - cellulose, hemicellulose, and lignin - and manufactures chemical products from these.